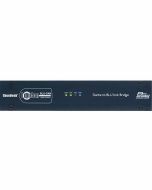 The Soundweb London BLU-BOB1 or "break-out box" offers 8 channels of analog audio output expansion via the Soundweb London high bandwidth, fault tolerant digital audio bus. 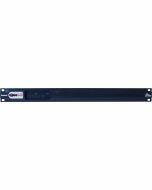 The BLU-BOB1 output channels are easily configured by six DIP switches located on the rear of the device, which select consecutive channels in groups of eight. 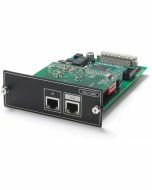 This simple configuration allows selection of any 8-channel range from the 256 channels available on the digital audio bus. Output channel assignments are configured by DIP switch selection only. The BLU-BOB1 is not configured by HiQnet London Architect. 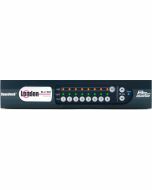 The 8 analog line level outputs utilize the same terminal block connectors as the other members of the Soundweb London family. Signal present and power status are clearly displayed by front panel LED indicators. The chassis is a half rack wide and can be rack mounted using the optional Rack-Mount Kit. 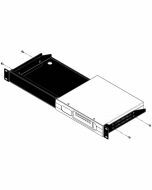 It can also be mounted under a table or on a wall using the included mounting brackets.